When you own a digital marketing agency, clients want to know where to invest their marketing dollars. A question we frequently receive is, "Should I invest in PPC or SEO?" According to WordStream, PPC stands for pay-per-click, "a model of internet marketing in which advertisers pay a fee each time one of their ads is clicked." Essentially, it's a way of buying visits to your site, rather than attempting to "earn" those visits organically. Earned placement via Google organic (or SEO) means you don't have to pay for each click. Below is an example of PPC result versus SEO via Google Search. The search term I used was "car insurance." Using Google's Keyword Planner, I was able to determine that the average cost per click for this car insurance keyword was nearly $60. This is one of the more expensive terms, folks! You'll notice there is a little box that says "Ad" to the right of the PPC advertisements. For organic results, this box does not display. Even though organic placements are below the ads, search engine users overwhelmingly click on organic results on Google and Bing by a margin of 94 percent to six percent, according to Search Engine Watch. 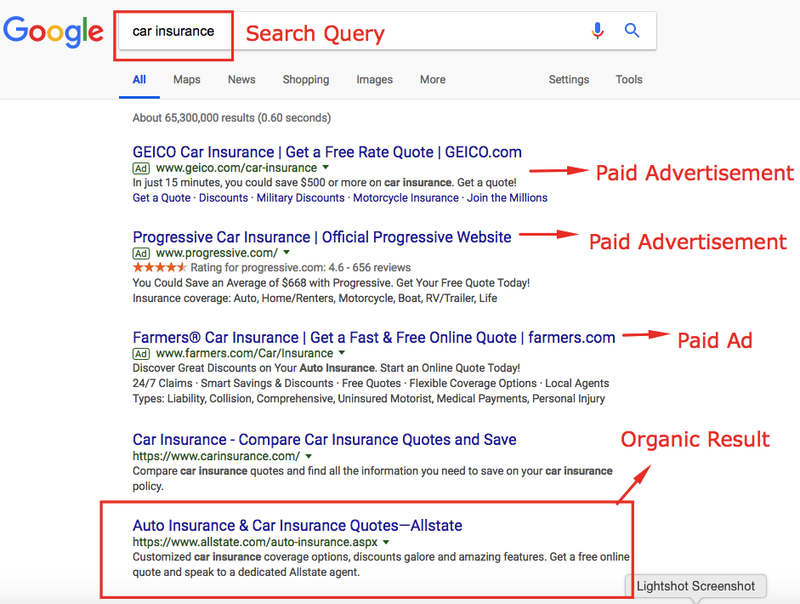 There is enough search volume where Geico, Progressive and Farmers could each get thousands of clicks per day via PPC advertisements. For this example, let's say Geico generates 100 clicks daily to its site via PPC. This would mean it would pay $6,000 on paid advertisements daily (100 clicks x $60 cost per click = $6,000). Allstate, on the other hand, ranks No. 1 organically. This means any time someone clicks on its organic placement, that is not costing it a penny. From an ROI perspective, this is obviously much more lucrative than paying $6,000 per day to acquire customers. The mistake we see most brands make is that they want to get results tomorrow. They don't have the patience to invest in SEO for three months or possibly three years from today. This makes them quick to jump into PPC and forget about SEO. PPC can drive results tomorrow. SEO is a longer-term process. On the other hand, we see businesses that don't want to pay each time someone clicks on their advertisement. They want to have the No. 1 position, similar to Allstate. The issue is that their SEO metrics are far behind their competitors. Their on-site SEO needs work. They need assistance with local directory submissions. They don't have a backlink and digital PR strategy. If you can rank in the top three positions on Google for every prominent keyword within your industry, you are fortunate and don't have to invest much in PPC. For the majority of businesses, that isn't the case, so PPC is necessary to drive traffic and generate sales. If you are profitable with your PPC, why not invest in this channel as well along with organic? It is just another way to increase your customer base. Don't think you can only invest in one of the two options between SEO and PPC. You should have a diversified game plan for both.